Subiendo como una moto: July 16th, 1996: Bjarne Riis explodes the watts on Hautacam! 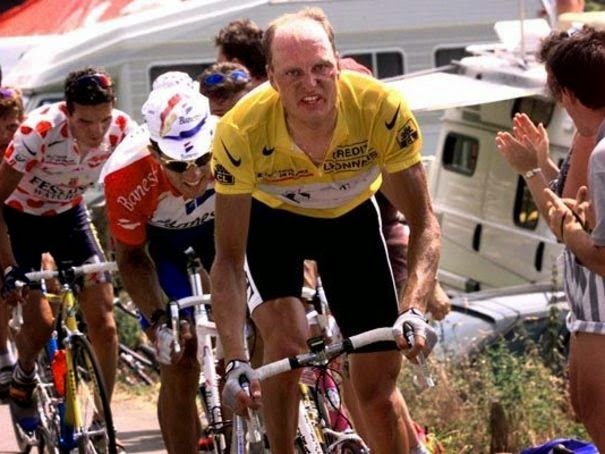 July 16th, 1996: Bjarne Riis explodes the watts on Hautacam! After two weeks of racing, there was nothing decided in this edition of the Tour : between the first and the fifth in overall, there is a gap of only two minutes. In a race in which the weather caused route changes and with a total of only three mountain-top finishes, waiting was not an option. Everyone's cards will be put on the table in this stage: Agen-Hautacam, 199 km in length. Not a single climb before the final one. This saves the peloton's energy for the big showdown. As expected, the first kilometers are ridden at a brutal speed, in one long line. Alex Zulle attacks very early in Arbouix but he's brought back after just a few minutes. Indurain, already hurt at the base of Hautacam (his heart already at more than 190 bpm) goes to the front and tries to impose his rhytm. The Telekom team had other plans though and right away, the Kaiser Ullrich sets a savage pace on the front. It's in these moments that Le Tour lives exclusive historical moments: the yellow jersey, Riis lets himself slip from the front to the back of the group, in the big ring. And then he comes at twice the speed and attacks! A little descent ruins his plans for the moment and allows the others to come back. After slowing down and seeming to look everyone in the eyes, he puts other blistering attacks. Leblanc, Dufaux and Virenque are the last to give up, they can't follow his wheel. Riding on insane gears, Bjarne, a mask of pain, slowly increases the gap to the chasers. In the last kilometer, defying his rivals and the laws of physics, he climbs in the big ring to the top. The winner of the Tour is known. Bjarne's ascent on Hautacam remains one of the fastest ever recorded in cycling's history and one of the most brutal performances in professional sports.